Today’s generation does not know that Indians were asked to give the prints of all 10 fingers in South Africa, as if they were criminals. We have an idea about the Dandi March and Champaran but do we know what were the events that prompted Gandhi to take these steps? The play revisits the stories of these movements as well as sheds light on how Gandhiji adopted the charkha and the philosophy of the three monkeys. The episodes in Gandhi’s life are connected by songs and symbols such as the charkha. We use the device of narration to reveal the story. The play does not emphasise only the past. In Gandhi’s act of cleaning toilets and streets of dirt, we are reminded that the present movement for swachhata is not new. 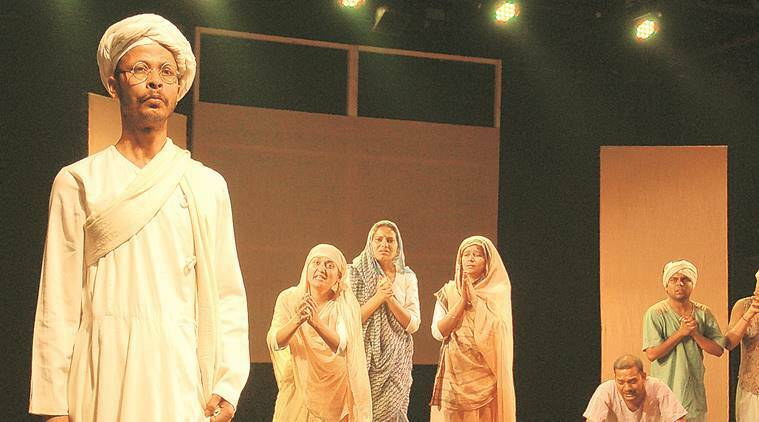 We were eager to understand little-known facets of Gandhi’s personality so we asked Ravindra Tripathi to write the script, which the cast turned into a play. We have opted for few properties on stage. The storytelling is taken forward with songs, such as Raghupati raghav and Vande Mataram as well as a Baul piece when we show Gandhi during the riots at Noakhali in West Bengal.